This is the 5th article in the series Make The Most of Your Time in the Pottery Studio. Have you ever been “in the zone” or “in a groove” or just plain working at max efficiency? Sometimes you hear how athletes are “in the zone” and performing at their best level. Does that just happen? Probably not. Think about how many hours top athletes spend practicing very specific actions. How can we find that zone or feel the flow when we’re making pottery? The more you practice certain actions, the easier and more efficient they become. Repeated actions can build your muscle memory which will allow your hands to do those actions automatically. I have found that instead of making a handful of mugs, six or eight bowls of different sizes, two large platters and a couple vases doesn’t allow me to get into that groove. Instead, if I work on an order of 50 mugs in a row, by the 10th mug I can throw them in half the time, almost with my eyes shut. This idea of batching, or making the same thing repeatedly, can increase muscle memory but can also increase efficiency in other ways. I make small ornaments and magnets that vary in size. When I made only a few at a time to fill small spaces in the next kiln load, I spent almost as much time cleaning brushes when I first started out. Since I wanted to have a variety of choices available, I would glaze only one or two ornaments with each glaze that I would use. If I didn’t have enough brushes for each glaze (because I didn’t have the right tools for the job) I had to go clean brushes to use the rest of the glazes. Now I decorate these kinds of pieces in large batches. I’ll get out 20-30 ornaments of the same size at one time, get the perfect size brush to cover the whole ornament in one stroke, and pick one glaze for the whole batch. Then I only have to clean the brush one time. After this first batch is done I move on to a different size or a different glaze. The whole idea is to keep the “flow” going instead of starting and stopping and starting again. Instead of making a few ornaments for each firing, I make a bunch at a time so they are ready to grab and fill in some spaces in the kiln for the next few firings. Another thing that has helped me find my flow is to reflect on my process. Maybe the way you do things is slowing you down? There are a couple ways that you could go about this. Have another person, even another potter watch you as you work. Or video yourself as you work on part of the process. (Then you have more content for social media!) Look for unneeded motions or at least question every movement you make. Do you really need to do it? Is there a more efficient movement that could accomplish the same thing? It may help to watch other potters work too. Maybe you’ll notice a new way to do something or realize that some of your actions aren’t really required. I’ve noticed that I’ve done certain things because that was the way I was taught or I just didn’t think about doing it another way. I’ve done these things so long that they have just become part of my process. It may take a mindful effort to change certain actions or even stop inefficient habits. 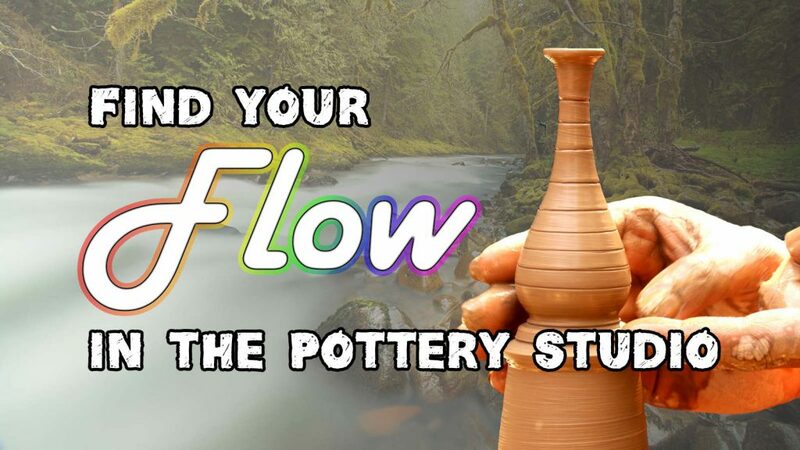 If you can get these new actions to be automatic though, you will be that much more efficient when you enter your “flow state” in the pottery studio. One last thing that has helped me be more productive is, well… thinking about what makes me feel more productive. What puts me in the mood to get stuff done? What keeps my energy level up? What makes the time fly by? For high level athletes and high performers from all walks of life, flow is a feeling they choose. It is summoned, not a lucky emotion that conveniently happens to show up just in time for kickoff. Is there a hot new album that I can’t wait to listen to over and over as I’m working at the wheel? Does my new audiobook keep my mind engaged instead of getting worn down from throwing 500 mugs in a row? Is that tea keeping me hydrated and feeling fresh? Maybe the silence allows me to think over some deep thoughts that I need to get through? Do I need to challenge myself a little bit more? Maybe I just need to take a couple deep breaths and get my mind right before I start each task. 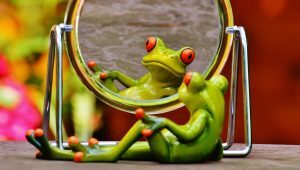 The original title of this article was “Find Your Groove…” but I changed it to “Find Your Flow…” after listening to Brendon Burchard’s audiobook “High Performance Habits” (for free). See the quote above. According to Mihay Csikszentmihalyi, flow happens when several of these elements are in play: You have goals that are clear and challenging yet attainable. Strong concentration and focused attention are required. The thing you’re doing is intrinsically rewarding. You lose self-consciousness a bit and feel serene. Time stops—you feel so focused on the present that you lose track of time. You’re getting immediate feedback on your performance. There’s a balance between your skill level and the challenge presented. You know that what you’re doing is doable even if difficult. You have a sense of personal control over the situation and the outcome. You stop thinking about your physical needs. You have the ability to focus completely on the activity at hand. If you have enjoyed the articles in the series Make The Most of Your Time in the Pottery Studio, you may want to consider reading the book. It provides some additional non-pottery-related details for ideas that have been covered in the series. It also gives me some ideas for additional articles. What can you do to find your flow? 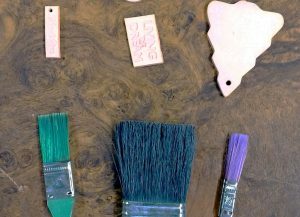 Do you have any ideas that help you find your flow in the pottery studio? Leave a comment below, or get in touch. Don’t forget, if you sign up for the Expert Clay email list you will get a free, printable checklist to remind you to make the most of your time in the pottery studio. Thanks for reading, sharing, and supporting!